Thursday, March 28, 2019. 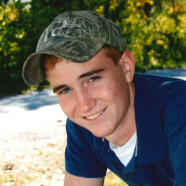 4:00-8:00 p.m.
Friday, March 29, 2019 8:00-9:30 a.m.
Jake Andrew Schrage, age 26, of Paducah, KY and formerly of St. Rose, died Friday, March 22, 2019 at his home. He was born May 23, 1992, a son of Matthew and Lisa, nee Williams, Schrage of St. Rose. In addition to his parents, he is survived by brothers, Brandon (Brooke) Schrage of Bradshaw, NE and Garrett (Samantha) Schrage of Ft. Benning, GA; his grandmothers, Marcella Williams and Florence Schrage; and numerous aunts, uncles, and cousins. He was preceded in death by his grandfathers, William D. Williams and Andrew J. Schrage. Jake was a graduate of Central Community High School and received his Civil Engineering Degree from the College of Engineering at SIU-Carbondale. He was working as a Civil Engineer for FBW in Paducah, KY and was a member of St. Francis de Sales Catholic Church in Paducah, KY. Jake enjoyed skiing, reading, brewing, shooting, rooting for the “Bama Tide”, and harassing his sisters-in-law. Funeral Mass of Christian Burial will be Friday, March 29, 2019 at 10:00 a.m. at St. Rose Catholic Church in St. Rose with Fr. Edward Schaefer presiding. Interment will follow in St. Rose Cemetery. Visitation will be Thursday, March 28, 2019 from 4:00-8:00 p.m. and again on Friday, March 29, 2019 from 8:00-9:30 a.m. at Moss Funeral Home in Breese. In lieu of flowers, plants, and other gifts, memorials may be made to “Let Us Move Mountains”, a non-profit organization supporting agriculture in Uganda or St. Rose Catholic Church and will be received at the funeral home.